Compare Term vs. Whole Life Insurance: Which is Best for You? Term life insurance is right for most people, and some of the biggest names in personal finance, like Dave Ramsey, Suze Orman, and Clark Howard agree and recommend term life insurance. But that doesn't mean it's right for everyone, and some people may benefit from whole life insurance. To decide between term or whole, it’s important to know how they’re different and what makes them right for your financial scenario. What else do you need to know? Let's dive in! How much can I afford to pay each month for life insurance? If budget is a concern, definitely go with term life insurance, as it’s much cheaper. What are my assets, debts and estate value? If your estate will be subject to the estate tax, a whole life policy can help cover that. Do I expect to self-insure in the future? If you go with term life, you need to be OK with your coverage running out and you’ll need to self-insure. What are my goals for my life insurance? If you just want to cover expenses for your family, go with term. If you want to build cash value, choose whole. What do I want to leave behind for my loved ones? The death benefit of a term life policy can go directly to your family, while a whole life policy is usually used to pay for the estate tax. The key definition when it comes to term life is the term - how long the policy is active. Term life policies expire after a set number of years, making it a good policy for anyone who expects to build wealth over time and won’t need the financial safety net life insurance provides later in life. But the term limit also limits coverage. If you still need that financial safety net when you’re in your 60s or 70s, you’ll need to shop for a new policy (which may be prohibitively expensive). Term life insurance is also relatively inexpensive. Because there aren't any additional fees or maintenance, it’s much more affordable than whole life. Term is the most affordable type of life insurance. ➞ Want more? Read our full explainer on term life insurance here. Your premium payments are split between the death benefit and cash value. Over time, the death benefit shrinks and the cash value component grows until the policy consists entirely of the cash value. You can do many things with the cash value, including taking out a loan, drawing from it for retirement or funding the policy. Most people have separate insurance and investment products. But if you have your insurance and investment bundled together, it works as a forced savings vehicle to help you save. Your whole life policy may also pay out dividends similar to a traditional investing vehicle. The cash value also works well for people who have complicated financial situations. It’s often used to cover the estate tax, so your full inheritance goes to your beneficiaries. Useful as part of a customized personal finance or estate planning strategy, thanks to the cash value component. It works as a forced savings vehicle. Whole life is far more expensive than term — sometimes up to six to 10 times the cost. The interest rate you'll receive on the cash value is likely less than you’d get if you invested it in other ways. ➞ Want more? Read our full explainer on whole life insurance here. Whole life insurance is best for people with complex financial needs who can afford the higher premium cost. As mentioned, whole life insurance is typically around six to ten times more expensive than a comparable term life policy. 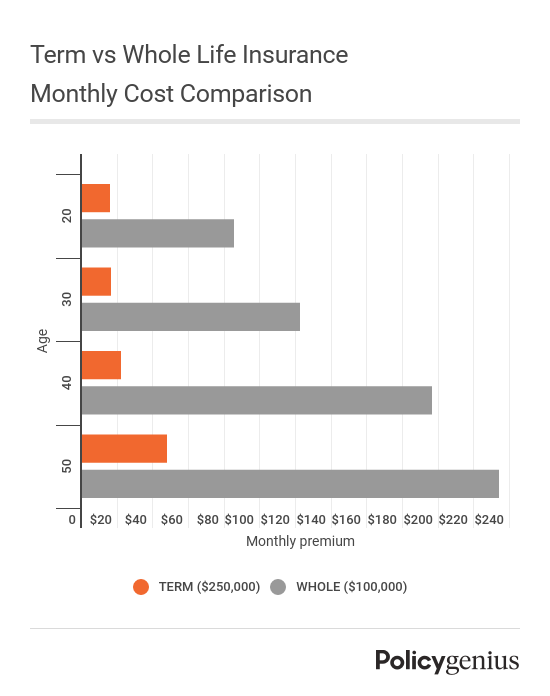 The charts below compares the monthly cost of a 20-year term policy ($250,000 death benefit) and a whole life policy ($100,000 death benefit) for a Preferred-rated male at different ages. Note that the term policy provides more than twice the coverage amount compared to the whole life policy, but is still significantly cheaper. What are the differences between term & whole life insurance policies? Because you can get a higher death benefit for a lower price, term life insurance is best for most people. Here are the other differences between term and whole life. Term life insurance lasts for a set number of years decided on when you purchase the policy. Terms are between 1-30 years and usually come in increments of 5 years. This is ideal for most people: After 30 years, many people have fewer financial obligations. Their mortgage is paid off. Their kids don’t live at home anymore, and they can self-insure with savings. They won’t keep paying for a policy they don’t need. If you have a term life insurance policy you aren’t ready to give up, most policies come with a default term conversion rider that turns the term policy into a whole policy without you needing to go through the underwriting process again. No matter what type of life insurance you choose, the life insurance company cannot alter the death benefit. The death benefit is usually untaxed, so your beneficiaries don’t have to worry about receiving less due to taxes. Term life insurance doesn’t have a cash value. This makes it easy to understand but means you don’t get any additional perks. Whole life insurance has a cash value, and it’s relatively safe compared to other types of permanent life insurance. Whole life insurance offers a guaranteed cash value, meaning it has a minimum growth rate. Other types of permanent life insurance can lose value over time depending on the wider market. However, whole life insurance is a conservative investment option and means you can likely find better returns with different investment vehicles. All permanent policies can be surrendered for their current cash value after a certain number of years, at which point the insurer pays the accumulated cash value minus any loans and fees. Term life insurance can come in two forms that affect cost — guaranteed level and annual renewable. Guaranteed level term life insurance keeps premiums the same for the entire policy term, but renewable annual term life insurance must be renewed periodically, each time raising the premiums. Whole life insurance premiums are level — they stay the same no matter how long you have the policy. There are differences between term and whole life insurance, but some concepts are the same across types. No matter what type of insurance you choose, here are some basic definitions you need to know. Beneficiary — The person(s) or institution that receives the death benefit. Learn the definitions to more common life insurance phrases. No matter what kind of life insurance you buy, make sure to shop around and compare quotes for the best rate. Everyone is different and each life insurers has its own methods for assessing applicants, so you may get a much cheaper rate with one insurer than another. Not sure how much life insurance you need? Our handy calculator can help you figure it out in 10 minutes or less.